Whew. I was relieved when Outlander episode 402 was over. I felt heavy-hearted, and had to sit quietly for a while after it was over. One thing I can say is that this show has never been one to keep the awful harshness of 18th century life stuff out of front and center, but that’s what I love about this series. So, let’s dive in to my recap as well as a few thoughts of Do No Harm. Listening to Jamie and Claire discuss Bonnet and his crew’s robbery is bringing back the “old” Jamie for me–he wants to protect all who are in his care, as he was brought up to do. I had thought he’d be a bit more beat-up looking, but realized that most of his abuse was taking in those amazing rock-hard abs–oh, wait–I can’t get those My Peak Challenge work-out Instagram pics that Sam posts so often out of my mind sometimes–sorry for the digression! But even though Jamie is feeling like letting Bonnet go is his “cross to bear,” it helps us see that Jamie is still a laird in his heart and mind. Watching the scene of the boat floating upriver and into view of River Run almost took my breath–it was a beautiful sight! It was almost as how I’d pictured it, minus the Spanish moss dripping from the trees, but I was amazed at how “Southern” the house and land looked! Living in North Carolina and near a historic plantation site, I was afraid that they wouldn’t get this right, but this was one location I approve of. Jamie seemed a little boy as he greeted his aunt, and then had to remember he had a wife to introduce, which I thought was adorable. Jocasta, played by Maria Doyle Kennedy, was much warmer than I remember from the books, and let on early enough that her eyesight had failed over the years. TV Jocasta is very proud of her plantation, almost to the point of bragging, as we hear during the scene when she is overseeing Claire’s fitting. This is where I get disheartened by the portrayal of Claire so far. I feel like the producers/writers/directors are really trying to make the audience aware that Claire is opposed to slavery, and she speaks out every chance she gets, but in a bossy, pushy way, even to Jocasta, who is their hostess. Yes, Claire is outspoken and a woman of her time, but she knows when to be that 20th century woman while living in the 18th, as well as when not to be. I feel like it’s being overdone. I just haven’t felt any of Claire’s warmth or sense of humor so far–and I know it’s only the second episode of the season, but still. During the fitting scene, where Phaedre (Natalie Simpson) is making sure Jocasta’s dress fits Claire perfectly, I was thrown by Phaedre’s accent. Trivial, I know, but I was surprised she was speaking with a slight Scots accent. Someone later reminded me that Phaedre was born at River Run, and Jocasta took her in for a house slave (a matter to be discussed later, I’m sure), was reared in the house, and so, learned to speak like Jocasta and Hector. Ulysses’ lack of any accent at all surprised me as well, and again I was reminded that Ulysses was born free, but sold into slavery after the death of his mother. He was bought by a schoolmaster, who educated him, and at the age of twenty, was bought by Hector Cameron, and brought to River Run. Colin McFarlane makes an absolutely amazing Ulysses–I can’t wait to see more of him! The big news at the dinner party was Jocasta’s decision to make Jamie her heir, and that she is making him her representative for all things River Run. We are soon introduced to Farquard Campbell, the local justice of the peace who schools Jamie on what would happen to freed slaves, if Jamie chose to do so as the new master of River Run, and how it has to be done lawfully. Jamie soon lets Claire know that he’s ready to ditch the plantation, take Governor Tryon up on his offer and head for the hills, where they can live as they please, without slaves. (Like Governor Tryon, Farquard Campbell was an actual figure in North Carolina’s history, and you can read a little about him here. And then we come to the incident at Jocasta’s sawmill in the woods, where Jocasta’s slaves are working under the watchful eye of her overseer, Byrnes. Rufus had been hit with Byrnes’ lash, and Rufus retaliated by cutting off the overseer’s ear with an ax. By the time Jamie, Claire and Campbell arrive at the mill, Rufus is being hoisted in the air by a sawmill hook, as Byrnes decided to take the matter of the law in his own hands. It was enough of a shock to read this part of Drums of Autumn, and even more so to see it on screen. Jamie forces Byrnes at gunpoint to let Rufus down so Claire can see to his wounds. She, in her typical emotion-driven way, runs to Rufus’ aid almost immediately. Rufus is brought back to the main house, a place he’s never been, and Claire removes the hook, sutures the wound, and offers comfort to him by asking him about his family, (reminiscent of the boar-hunting scene with Geordie in season 1). Claire receives a stern talking-to from Ulysses that she may not have done the right thing by saving Rufus, and may be risking the well-being all of the slaves at River Run. She definitely needed this jolt into the ways of Colonial laws and slave-owning culture, but she wasn’t convinced. Jamie’s action of handling the situation as he did angers other overseers and slave owners in the area, and the angry mob shows up at River Run, demanding Rufus be released to them so they may hang him, as is the law according to the law of bloodshed. Jocasta, in true blood-is-thicker-than-water fashion, blames Claire’s “foolish ways.” Jamie suggests that Claire ease Rufus’ suffering by giving him something before he has to be released to the mob. Jamie’s prayer by Rufus’ bedside was so moving–I have missed Jamie’s faith in the television series. In the books, it’s part of what makes Jamie Fraser Jamie Fraser to me. Hopefully they’ll pull more of that aspect of him into the show as time goes on. Eventually, Jamie bravely carries a dead Rufus to the steps of the plantation house, a noose is placed around his neck, and the delirious mob drags him to the nearest tree, and hangs him there, for all of those at River Run to see. In spite of the necessary plot changes, and what I can only describe as Claire’s haughtiness in this episode, I liked it–I can’t say that I “enjoyed” it. It was expertly acted–Jerome Holder, the actor who portrayed Rufus, was absolutely amazing, and moved me to tears as he spoke of fishing in the river at night, and dreaming of seeing his sister once more. The sets, the costumes–everything–is so well thought out, just like Diana Gabaldon’s research and writing. I am almost never not in awe of what I see on screen. Thankfully, we have the comic relief in this episode of Rollo’s meeting with a skunk and meeting John Quincy Myers (Kyle Rees)–hernia-free, apparently. 🙂 His character, in book and on the show, reminds me of Mr. Edwards in the Little House books by Laura Ingalls Wilder–a bit of a wild man, unmarried, and making a living in the frontier that is Colonial North Carolina. I hope we see a lot more of him–he makes me miss Angus and Rupert even more! As darkly as the first two episodes have ended, I can only hope we will be able to see some happiness in episode three. The Frasers have been through so much already, and so have the viewers–I’m ready for some good times to come to them in North Carolina. 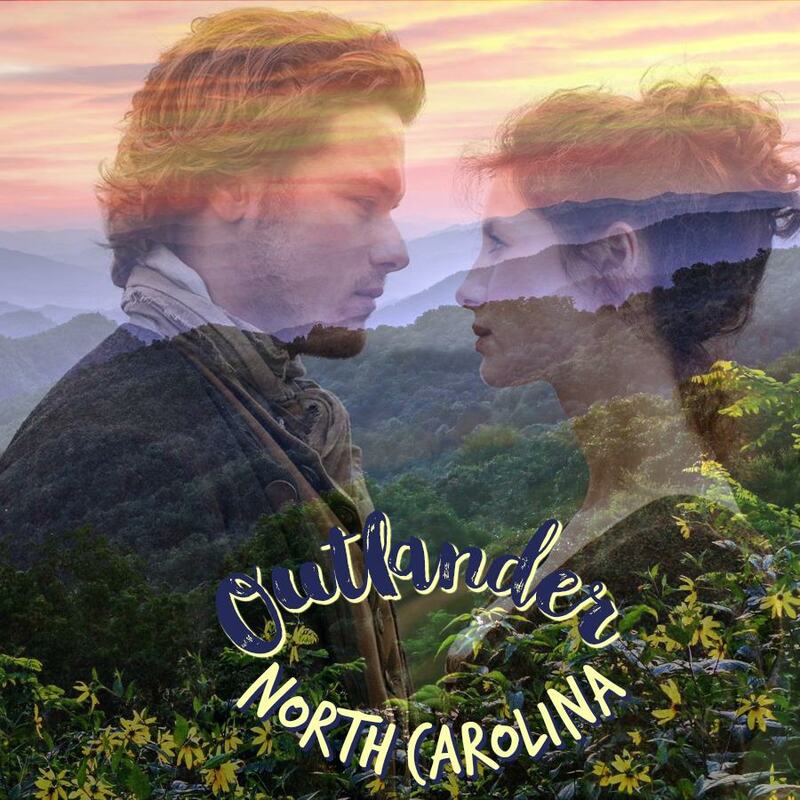 Susan Jackson is a mother of four who lives in coastal North Carolina, and is an avid Outlander fan. Besides reading, she loves cooking and baking, and music. She is a thyroid cancer survivor and has worked in education most of her life. She hopes to one day blog about her thyroid cancer journey. She is a contributing author for Outlander North Carolina and, among other articles, has previously written about the infamous Stede Bonnet in Will The Real Stephen Bonnet Please Stand Up? We made it! Well actually, the Frasers made it to North Carolina!!! But we made it through the dreadful Droughtlander! Now we can bask in the glow of North Carolina and Fraser’s Ridge from our TV! What a packed episode and the second episode is looking to be even more packed or maybe that was an extended version of what’s to come! WOW! Starting off, I thought the beginning sequence was quite interesting with the EARLY (almost neanderthal like) inhabitants of the Americas and the stone circles. Then when those words and numbers appeared on the screen ‘NORTH CAROLINA 1767’, I’m pretty sure I heard a collective cheer from every North Carolina Outlander fan! I turned to my husband and said, I’m sure the North Carolinians either squealed or cheered when they finally saw that. Right off, I thought the set was amazing! Those buildings looked amazing! It was rough seeing Hayes hung and seeing Jamie and Lesley go through that. Am I the only one who thought Bonnet had some fancy footwork getting out of that town square? The opening credits blue grassy style is such a good change. Yes, I will miss the bagpipes. I mean, come on who won’t? However, we are in N.C. now. It’s the soon to be Southern style of music so let’s get use to it, aye? I loved Lesley’s singing in Gaelic, joined by the rest of the family and then the rest of the tavern. The moment Jamie and Claire had in the woods was what I think we all needed. We needed to know that they were the same Jamie and Claire we always knew. It has been a long and tough ride since Claire went back through the stones, reunited with Jamie, went on the cross ocean voyage, were separated again and then were shipwrecked. They needed that connection and probably a vacation. “After you left me, after Culloden I was dead, and all that time I loved you. There’s just something about that statement and how he said it with his Scottish lilt that got me. I can’t describe it, but I will try. It’s spiritual and I don’t know if it’s I wish my husband would whisper sweet nothings like that to me by a campfire or what but it gave me gooseys and continues to every dang time I hear it, thanks to one Sam Hueghan. I’m sure it was a bit confusing for non book readers as to who were all the dinner guests at Lillington’s but one or two rather that I recognized were Phillip Wylie and his sister, Judith. What a little twit she is! Will we see more from them? Time will tell! When they were back in the ‘family huddle’ and Fergus revealed that Marsali was expecting, I loved Jamie’s response was so sweet. I’m not sure what was going on with Claire’s response. Fear for her? Was it what they wanted? If you recall, she had mentioned to Claire that she wanted to enjoy being married to Fergus first before having little wee bairns running around. I don’t blame her! But then again that day in age it was almost expected after tying the knot. Sigh….he had that little twinkle in his eye. Was he getting teary eyed? I don’t know, but it was sweet and special. And then it happened that night, the invasion. Bonnet that slippery snake! He had heard everything they had planned and knew what possessions they had on them. Just when the American Dream was beginning for them, it turned into a nightmare! At first, the piano caught me off guard. At first I felt like I was on a Louisiana River boat or something. I hadn’t remembered a piano being on board nor thought it could fit! And then it hit or rather they hit! Bonnet and his thieving men! I felt so violated for them. Honestly, I think the music fit. I know, I know, such controversy but honestly would you wanted to totally hear all the punches and sounds of Jamie getting the crap kicked out of him or Claire’s gasps and cries? Not me! Could they have picked another song? Sure! Are we the producers and writers? Nope! We don’t have a say. Sorry! And the ring! Frank’s ring was left! I heard (SPOILER ALERT) that it will logistically be easier for Brianna to identify Jamie’s ring down the road and try to recover it. Her mom wore that ring her life when she was growing up so she knows what it looks like. It’s distinct. Either that or Jamie could possibly get Claire a ring that looks more so like the book version of the ring. Food for thought…. What a cliff hanger though! I can’t wait to see how things get all sorted out. I’m so glad to have the show back on the air. It feels like I’m reunited with old friends! It feel so good. Warm and cozy too going into the Fall, Winter and Holiday time! And can I just say, Hot dang the Laird Jacket is back! Well there you have it, my recap of Season 4 Episode 1, until next time! Tara Heller is the mother of two boys, who lives in South Central Pennsylvania. However her heart is the South. Although she is fairly new to Outlander, she has truly immersed herself in it. She also loves history, especially the 18th century, genealogy, visiting the coast, spending time with family and blogging atwww.ladyoutnumbered321.com. You can read about her MPC story here. Will The Real Stephen Bonnet Please Stand Up? Early in Drums of Autumn (DOA), Claire and Jamie meet Stephen Bonnet, a pirate who had just escaped hanging. Against his better judgment, Jamie lets Bonnet come along with them–under cover–and go back to his ship. And that was the beginning of a loooong back and forth relationship, if you will, of the Frasers and the despicable Stephen Bonnet. In fact, I would say the man is hated much, much more than Geillis in the book series. Rightly so, as he was truly a degenerate, with no hope of rehabilitation–a career pirate. Since the time of piracy’s heydays in the Colonial period, history has somehow managed to romanticize it. Not to be confused with privateering, which was a ship whose crew was authorized by their government to capture enemy merchant ships during war time, pirates captured any boat they thought had goods aboard that they could either sell for the profit, or keep themselves. Pirates murdered, maimed and stole simply out of greed. When I first read the name Stephen Bonnet in DOA, I thought I had heard the name before. Living on the coast of North Carolina, there are plenty of old pirate stories hanging around, and Blackbeard is the best-known pirate in these parts, as he kept headquarters in the old town of Bath, which isn’t far from me. There are endless stories of treasure that Edward “Blackbeard” Teach (or a/k/a Thatch) has hidden all over the Outer Banks, even as far inland as Edenton. (No one has found any of it, by the way–but then again, who would tell it if they did?) But I knew there was something familiar about Bonnet’s name, so I looked it up. Come to find out, Stephen Bonnet is truly a fictional character, but his name is very similar to the man known as the Gentleman Pirate, Major Stede Bonnet. Major Stede Bonnet was born in Barbados in 1688 to a fairly well-to-do English family. His father died when he was six years old, and he became owner of his father’s land and holdings. He was a member of the Barbados militia, and in 1709, married a young woman named Mary, and they had four children. As we say, life was good. Then something happened. No one knows exactly when, but one of the Bonnet’s children died. Some blamed Stede’s decision to become a pirate on his grief, some blamed it on an unhappy marriage, and some chalk it up to Stede being a Jacobite and wanting to spite King George in any way he could. We Outlander fans are pros on terms like Jacobite, and even know who King George was. 😉 Whatever the reason, Stede used his own money to have a ship built, rigged it with cannons, named it the Revenge, got a crew together, and set sail. Fortunately for the Major, he didn’t do too badly in 1717, hanging out around the coast from the Carolinas to New York, plundering away, in spite of the fact that he had no sailing experience whatever. His crew didn’t like him, though, as he ordered them around, not having a clue about navigation, or running a ship. His captain’s cabin was filled with books, and he often lay around like the well-to-do man that he was. One day, his lack of seafaring knowledge was plain to see when he ordered the attack of a Spanish ship. The Revenge was badly damaged, as were members of his crew, along with their captain. During his convalescence, Bonnet met Blackbeard. Bonnet’s crew begged the fairly new pirate captain, Blackbeard, to take over the Revenge because Bonnet had no idea what he was doing. They needed a sure and confident leader, and Blackbeard, though just starting out with his own ship, was an experienced pirate. Blackbeard convinced Bonnet that he could be his guest while his injuries healed, and the pampered Bonnet was only too happy to accept. The two pirate captains were very successful in their partnership and the Gentleman Pirate must have thought every pirate captain was a gentleman. He would soon find out Blackbeard was a shrewd man, and a true pirate. Sometime in early 1718, Bonnet was much improved and ready to take on the seas again, but ran into trouble when he attacked another ship and the attack failed. Once again, the captain and crew took refuge on Blackbeard’s ship, the Queen Anne’s Revenge. Blackbeard suggested Bonnet and his crew go into the town of Bath to seek out a governor’s pardon. So much for good partnerships because while Bonnett and some of his crew were being pardoned and authorized to privateer, Blackbeard took off with their loot and the remaining crew! After this, Bonnet tried really hard to stick to privateering and attacking only Spanish ships, as the governor had given him the right to do. However, being the not-so-good man that he was, he ended up getting back into piracy and spending about two months looking for the double-crossing Edward Teach and the Queen Anne’s Revenge. Bonnet never found Blackbeard, as both Blackbeard’s and Bonnet’s days were numbered. While Bonnet was on the run, Blackbeard, in November 1718, was killed in a long fight with British soldiers near Ocracoke Island in North Carolina, and his head was taken and hung from the front of the military ship to prove that Blackbeard was no longer in the pirate business. In the meantime, Bonnet had changed his ship’s name to the Royal James to avoid detection from officials. They were onto him, however, and caught up with him as the boat underwent some repairs while harboring at a creek near the mouth of the Cape Fear River and the quaint little town of Southport. A fight ensued (The Battle of Cape Fear also called the Battle of the Sandbars), and the pirate ultimately surrendered. After a brief escape, old Stede was recaptured and hanged, along with his crew, in December 1718. Diana has asked many times (somewhat jokingly) if we think she makes up the “stuff” she writes in her books. Well, she does but being the researcher she is, we also know she uses real people to create some fictional ones. Think about Geillis Duncan who was inspired by the nonfictional Gellie Duncan of the 1590’s Berwick Witch Trials in Scotland. So, what do you think? Could Stede Bonnet have been Diana’s inspiration for her fictional Stephen Bonnet? What other fictional characters do you think Diana has created from real people? Susan Jackson is a mother of four who lives in coastal North Carolina, and an avid Outlander fan. Besides reading, she loves cooking and baking, and music. She is a thyroid cancer survivor and has worked in education most of her life. She hopes to one day blog about her thyroid cancer journey.